After months of tireless work to bring awareness to state legislators about the harm associated with solitary confinement, a bill was passed that doesn’t even scratch the surface of what must happen to humanize criminal justice in this state. When states as notorious for prisoner abuse as California and Texas are making changes in prisoner treatment, one must wonder why Connecticut is lagging behind. A bill that places new limits on the use of solitary confinement in Connecticut prisons is headed to Gov. Dannel P. Malloy for consideration following final passage in the House Wednesday. The measure would provide greater transparency around the use of solitary confinement and limit the Department of Correction's ability to place prisoners under 18 in the harshest form of solitary confinement. "The "Inside the Box" project invites people to spend some time in a full-size replica of a prison cell. Lori Mack (@lmackwnpr) of Here & Now contributor WNPR paid a visit to the exhibit during a stop in New Haven, Connecticut, and has our story." "He was just one of many Tuesday left by themselves under a fluorescent light in a small cell with a bunk, but unlike the estimated 80,000 inmates nationwide in solitary confinement, Sen. Gary Winfield, D-New Haven, was able to leave after two hours. The cell was a replica built by lawyers, psychiatrists and religious leaders who are bringing a national movement to limit the use of solitary confinement to Connecticut. Lawmakers and visitors to the state Capitol are being encouraged to experience what it would be like to be in solitary confinement. There’s a sign-up sheet where anyone willing can sit by themselves in the cell where they can hear the hum of the light and recorded sounds from an actual prison in Maine." "Connecticut Commissioner of Corrections Scott Semple began his talk Thursday by stating a fundamental belief: that “a system without hope is a system in chaos.” It is this conviction that has motivated the many corrections reforms Semple discussed in the talk, “What does a progressive prison system look like? "Yale Law School’s Lillian Goldman Library is housing more than just legal tomes and bleary-eyed students this week. In between the stacks stands a replicated solitary confinement cell, with gray cinder block walls, fluorescent lights, and a prison toilet-sink combo. The 10-by-12-foot cell was installed in the library for seven days as part of an anti-solitary confinement campaign arranged by a consortium of Connecticut churches, civil rights organizations and Yale entities. “It’s almost an assault on your senses,” said Sameer Jaywant, a second-year Yale law student who helped bring the cell to campus through the school’s Allard K. Lowenstein International Human Rights Clinic. “The light is very reminiscent of correctional institutions, or even mental institutions. The sounds — the audio is taken from a real jail — are very striking. There’s an echoing sound of people banging on metal, and yelling and screaming. There’s also a feeling of claustrophobia. You’re penned in. There’s nowhere to go. The longer you sit in there, the more it feels like the walls are closing in on you a little bit.”"
Solitary confinement is a well-established practice in the United States. Although the intent of Quakers and Calvinists was to isolate convicts for spiritual reflection, the term quickly picked up a negative connotation. Today, correctional facilities maintain that practices like “administrative segregation” and “special housing units” are necessary for keeping order in prisons across America." "Haunting shrieks, the repeated pounding of a steel door, the echoing voices of guards and then silence: These are sounds Yalies will hear when they step “Inside the Box” at Sterling Memorial Library’s latest exhibit — a life-sized solitary confinement cell to raise awareness of what organizers call a hidden form of torture. The windowless replica, no bigger than a large closet, is modeled after a solitary unit in a Wisconsin prison and is accompanied by recordings from a facility in Maine. 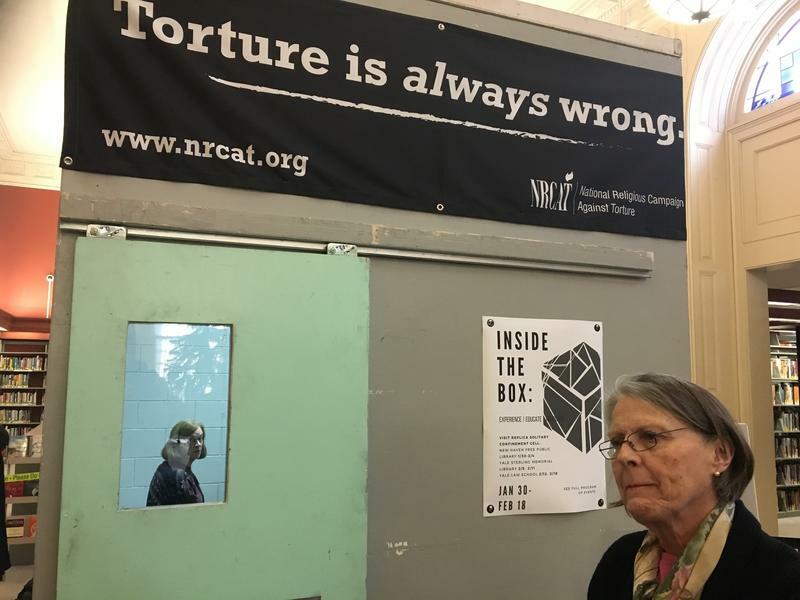 Aiming to educate the public while pushing for legislative action, the National Religious Campaign Against Torture led the effort to bring the cell to New Haven. The project drew wide support from activist organizations, including the American Civil Liberties Union of Connecticut, three New Haven churches, several organizations at the Law School and the Yale Undergraduate Prison Project. The exhibit will stand outside the library’s Starr Reference Room until Feb. 12." "A traveling exhibit, now in New Haven, aims to give people the opportunity to experience solitary confinement and learn about its effects. It includes a replica of a prison cell and people are invited to go "Inside the Box." The door closed behind me as I walked into a grey cell that’s 10 feet by 12 feet. It had a toilet, sink, and a wooden box for a bed. There was an overhead fluorescent light and recorded sounds from an actual prison. Reverend Allie Perry, board president of the National Religious Campaign Against Torture, explained that it's actually a sound track from a supermax prison in Maine." "An exhibit in New Haven, Connecticut, lets people spend a few minutes inside of a solitary confinement cell. "Inside the Box" is a replica solitary cell created by a religious human rights group that says it wants to show people solitary confinement is essentially torture. The exhibit is a 10 X 12 foot gray box. It sits in the middle of a room in the New Haven Free Public Library. When you step inside, the sound of a busy reception goes away, and is replaced with rattling, pounding and almost inhuman screams." Listen to the sounds from inside the box and read the full article here. "The torture lasted about a month. That’s how Keishar Tucker said he remembers it. It was Tucker’s first stint in solitary confinement inside Northern Correctional Institution in Somers. Tucker said he couldn’t deal with his prison experience, so he often acted out. So into the solitary cell he went. It was the first of several stays for an experience the New Haven resident said he considers torture. "Keishar Tucker's first experience in solitary confinement was when he was 17. Nearly two decades later, it hasn't left him. "I still suffer ... I have anxiety attacks. It's just a place that no one should have to endure," Tucker, now 35, said. Sometimes it was for weeks, other times it was for months, during his 10 or so years in prison after a larceny conviction." Watch Keishar talk about his experiences and read the full article here. "NEW HAVEN, Conn. (WTNH) – Starting Monday, the public gets a chance to experience what solitary confinement is like. A traveling exhibition of a replica cell is in New Haven for the next three weeks. The first stop is the New Haven Free Public Library, and if you come to the library to be alone, now you can really be alone. You can step inside a solitary confinement prison cell." "State Rep. Robyn Porter sat inside a 10 foot-by-12 foot box looking at the blue cinderblock walls. Listening to the sounds of prison, she got a taste of what her son once experienced. “I started to think about how my son had been in prison and how he had sat in a [solitary] cell,” she recalled Monday. Porter didn’t go to jail herself. She took a turn sitting inside a replica of a maximum-security prison cell in Wisconsin, newly on display at the downtown Ives branch of the New Haven Free Public Library."